Yay! 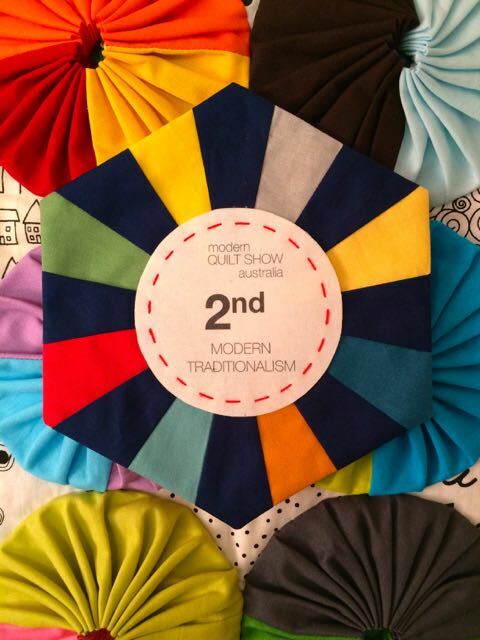 I've got the go ahead to share my yoyo quilt that won 2nd place in the Modern Traditionalism category at the Modern Quilt Show Australia. I'm pleased to introduce Yo Yos a la Mode. I felt sorry for the humble yoyo that is often perceived as old fashioned and boring so I set out to show they do have a modern side. I dressed them in bold colours, sewed them in half, and half again and served them up on a low volume background, Voila - Yoyos a la Mode!! YoYos a la Mode isn't only about the individual yoyos but the patterns and shapes they create as a whole. At first I played with organised layouts but then found the more random placement made this quilt more dynamic. Like pieces of a puzzle, the shapes seem to shift from circles to squares and back to circles again. 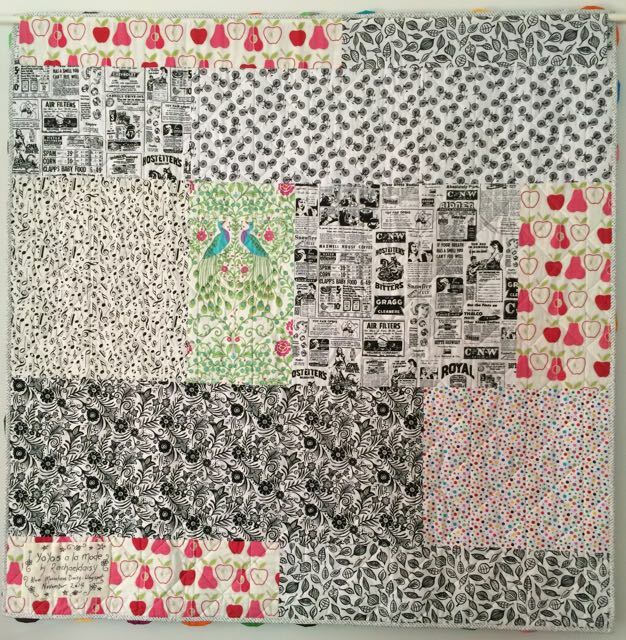 I do have plans for a quilt with more structured layouts using the same ideas so stay tuned for those. Upon closer inspection the spaces in between the yoyos also play an integral part. some of which reveal fussy cut snippets, others have geometric prints. The back of the quilt is a mix of fabrics that just seemed to go together. I often think my quilts have more exciting lives than I do. Not only did YoYos a la Mode get to be part of the Modern Quilt Show but the pattern for this quilt will appear in Quilter's Companion magazine #74, which is on sale in July. I'm looking forward to seeing how they've styled and photographed it. You can check out their facebook for more info about the magazine. Update: The magazine details are in this post . So there you go , that's my modern yoyo quilt. What do you think, have I achieved my aim to prove that yoyos can be big, bold and striking and not just “old fashioned and boring” ? Update: The magazine details are in this post . Of course you have convinced me!!! It's blooming gorgeous! I am curious about the construction...did you piece fabric? I guess so! And did you use a yoyo maker or did you gather them yourself- they are SO uniform, neatly formed and almost pleated! Beautiful work Rachael! Congratulations again, and so well deserved!!! Congratulations again RAchael! I've just been over and checked out the site....maybe I'll come up for it next year! Congrats again !!! Tis lovely, love the little snippets in between each yo yo ! Holy guacamole. I think that is simple amazing. I love yoyos but I would NEVER have thought to make such a funky, clever, sizzling quilt out of them. 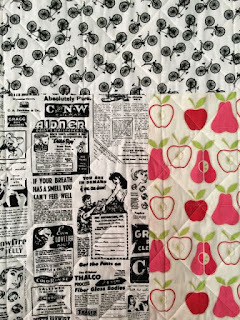 I just love how you've taken a simple and (yeah, you're right) old-fashioned technique and, with some simple modern changes, made it into such a brilliant interesting quilt. I'm in awe. So bright and cheerful and so, so different from the usual yo-yo quilt! Congratulations! Love it! Of course, you knew I'd be on board with yo yo's no matter what you did with them. :) They truly are an undervalued tool to have. You've done a superb job of showcasing them in an unexpected way. Congrats! Congratulations again on the ribbon and the publication of this super graphic a fun fun quilt. I love love the pieced the backing. the prints are such a fun mix. wee - you really are a Rock Star!! 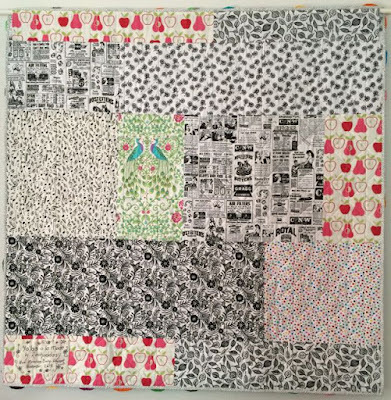 Congratulations on another fun and playful quilt. Thanks for giving the humble yoyo a new and exciting life! Yes! They are fabulous! The quilt is fabulous! You are so talented, clever & creative! Another amazing quilt! Your ideas are endless. The humble yo yo is now a shining star! Yo there! I love it, and I do love the old yo yo quilts too. This is a wonderful play on colour and texture, to me it's an art piece as well as a functional quilt. That's what I am loving about quilting is the way some quilts become art like. I mean I can see this hanging in some board room or entry foyer beaming it's way into people's hearts. Well done Mrs Daisy! Congratulations Rachael, just loved seeing your quilts 'in the flesh' at Kiama. My mum dragged me around the corner to see your Best of Show quilt, she told me that's her favourite and write it down (for viewers choice). Wow! We then got further into the show and found your yo-yos, and spent some time listening to people find all the different elements and shapes within. I love eavesdropping at shows, it makes you look at quilts through many different eyes. I'm another yo yo fan (biscuits as well) I love all the little secondary patterns I can see in the quilt, reminds me a bit of a maze, and then the extra surprises of the fussy cut background fabrics to look for as well. WOW! You've hit the mark with this quilt! Very modern, very different and all kinds of fun! No wonder you won an award AND it's getting published too! You just amaze me with your creativity, my friend! You excel at "thinking outside the box". I love how you just went with the random placement instead of getting fussy. It really works, and it does look so modern. No "stuffy, old-fashioned" yo-yo's here! I also love the little bits of background showing with peek-a-boo snippets of interesting things. And the back is perfect for the quilt! Fun all the way around! Way to go, Rachael! Your blurb sums up your style. Traditional piecing turning summer saults into the 21st century. Your yo-yo's are far more sufisticated than the big ones stitched onto the quilt on my lap. I love your ability to explore new ideas and shake up, jiggle slightly, those quilt designs we have looked at and loved for a long time. Your yoyo's are a wonderful playful interpretation. Congratulations! You. Are. AMAZING. I don't like yo-yo's - never did - but I do like these, a lot!!! And I love the secondary patterns that form from the color placements. Wow, wow, and just wow. You have such great ideas! 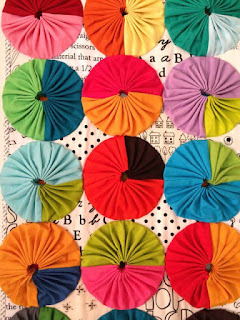 Love the clever yoyos and the little diamonds of fabric peeping through. And of course the backing is interesting too. 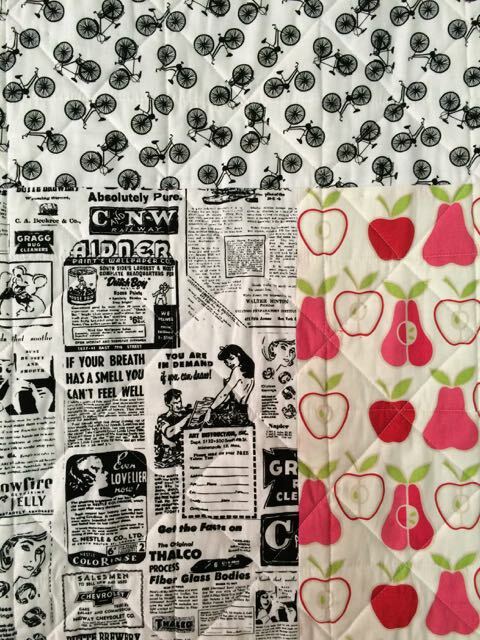 The apple and pear fabric is lovely. So pleased your quilt was so well received. And now your hilt is appearing in a magazine too. Congratulations. Congrats Rachael! 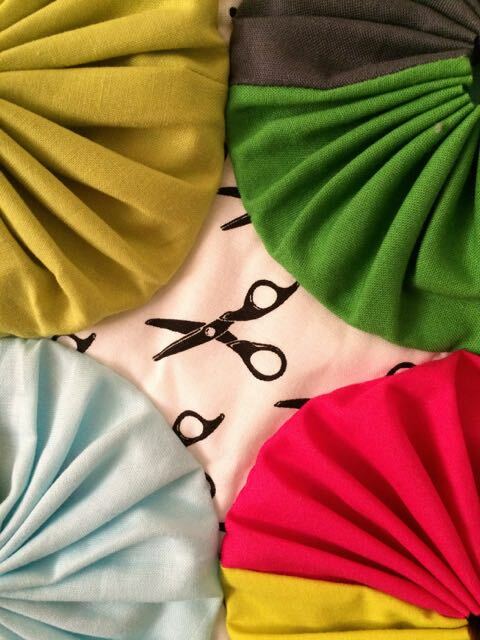 Love your bright modern puffs. Love the occasional triangle of colour! Congrats on your fabulous success!! Reading your description made me look far more carefully at your quilt this time to see all that you had done with it. I love the different colours in the yoyos and the straight lines they created with the colour changes. Which of course is odd considering they are circles. That is a great effect. And I do like all the little peeks at the background fabrics. I can't wait to see it in the magazine. Rachael, you are playing with my brain with this one! I love the squares that move and change on this one, great thinking! Very original, well done. You don't seam (see what I did there hehe) scarred to push boundaries and try new things. It sure pays off with all your amazing quilts. I especially love this one. I love everything about it. Well done. I love this quilt Rachael. Its simplicity with the bold colours makes it so stunning. Saying that though, it took you to design it! Such a great modern look on an old favourite. Congratulations again! I think you have more than proven that yoyos are not at all old fashioned and boring. I love the random squares that the quarters and halves form. They are mesmerizing! I always enjoy seeing where your creativity leads. You are my creative IDOL!!!! LOVE THIS to the umpteenth power!!! 'Greeneggs' said it all when she said SIZZLING when referring to your quilt! What a feat, I wonder if I can get Quilter's Companion here...going to the 'big' city today and I will check. The juxtaposition of all those colours really makes them come alive and move. And of course the 'snippets' add to it. 'Stepping' back a bit I can see squares in squares...very clever! Congratulations Rachael, Your yoyo quilt IS AMAZING!, I don't know if we here in Florida,USA gets this magazine or not, But I sure will look for it come July ! Also I so LOVE visiting your blog, It just truly brightens my day and even encourages and motivates me.. Thank You for all your bright colors and happiness you share! 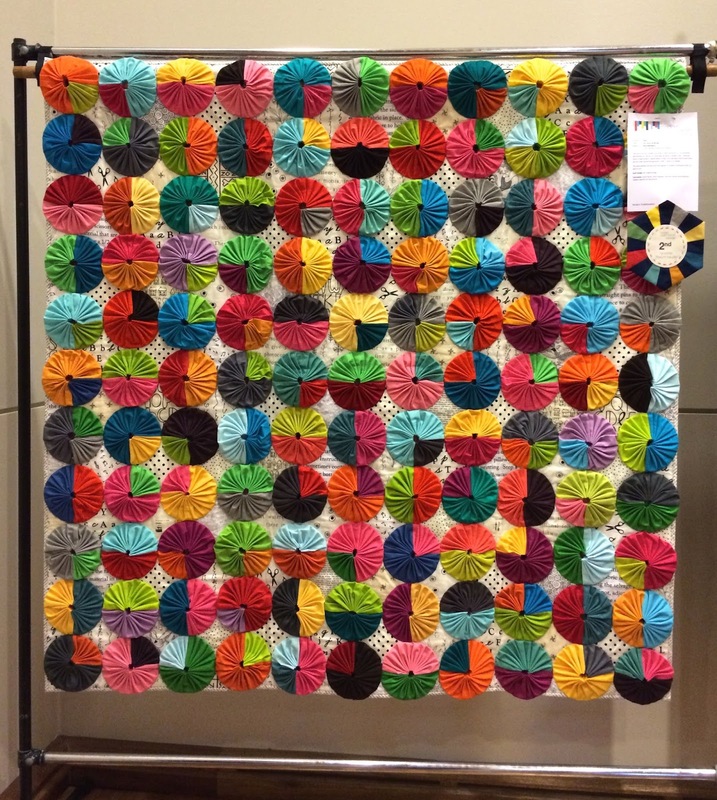 Well, you've certainly given yo-yo's a new lease of life with this quilt - it's gorgeous!! I can see yo-yo's being "the next big thing" courtesy of Yo Yo's a la Mode! Congrats on the magazine entry - I'll be looking out for the issue. This is brilliant Rachael! The more you look at it the more you find, I like a quilt like that, yet you have enough structure and cohesion to make it work. Your Second Place ribbon almost looks like it's part of the quilt. So cute!! I think this is the first yo-yo quilt I've really liked!! Amazing job! LOVE! you've done it again taken a classic and made it fabulous and modern! so impressed! Congratulations on your win and your quilt Rachael, how big are your yoyo's? I'm guessing about 2" minimum, I've got that scissor print but know it comes in two scales. Or maybe two different but similar prints.. Thanks for sharing your process, love how you added the pears to all the black and white prints. Is Quilter's Companion an Australian publication? Don't think I've seen it in Canada. 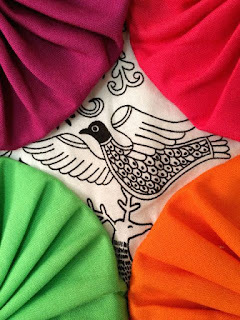 Your yoyo quilt screams modern , vibrant and definitely FUN! Not at all nanna! Congratuations on your second place! Congratulations on your quilt going to be in Quilters Companion. I just knew you could be a pattern designer. You have the goods guurrl! Love your fresh approach to the humble yo-yo. Because of the placement of some of your solids I see squares. Wow Rachael. That's amazing. I LOVE it!!! Congratulations on your second place!!! This takes my breath away. So textural and so optically stimulating. It well deserves the adventurous life it is leading now! Another great quilt. I too love yo-yos but am never sure just how to use them. Now you have me looking at them in a new way, so interesting and fun! Hey, how did I miss seeing this? I love the way you see possibilities in things. Yoyos to me are the things that made up those clowns that scared me as a child. But in your hands, they become a thing of wonder! How clever! I'm always amazed that with so many quilt designers out there you can come up with new and unexpected interpretations. I keep seeing different components - squares, Pacmen and fun pops of colour. I love it. Congratulations and a job well done, your quilts are an absolute delight, so much fun and inspiration. What a fun quilt! The backing is awesome too! 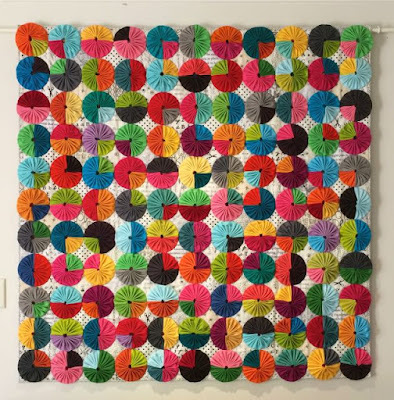 Dear Rachel, many congratulations on your fabulous YoYo quilt wallhanging, I love it and wondered if you are able to sell the pattern yourself as a download. I am in the UK and cannot find the magazine!! would love to have a go at yoyo's and make something similar.